BC Moments Massive Vending Machine Surprises San Francisco! 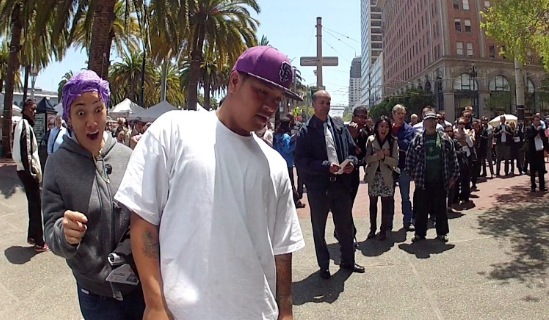 San Franciscans passing through Justin Herman Plaza May 17th got a big surprise! Tourism British Columbia flipped the switch on the BC Moments Machine which is a one of a kind, 14-foot tall, 10-foot wide vending machine. The BC Moments Machine offered items like mountain bikes, kayaks and made in BC surfboards. Take a look at the surprise on these guys face when when they received a mountain bike souvenir from BC! The BC Moments Machine will be in San Francisco until May 19 and is part of the ‘100 BC Moments’ Campaign encouraging travellers to experience what BC has to offer this summer. Chris Wheeler Media is catching the action and click here to see another video showing more of the BC Moments Machine! From May 15 to 24, 2012, the campaign hash tag #100BCMoments received an estimated reach on Twitter of 103,548 impressions. From May 17 to19, 325 mementos were provided through the BC Moments Machine and 7,000 BC Moments postcards were handed out to the crowd of onlookers in San Francisco. The event was covered in approximately 40 news stories in the United States, which had a combined total of audience impressions of over 34 million.